The Residence Palazzo Ossuna is located in Trapani, in the heart of the historic center of the old town, an area which is rich in monuments and services such as restaurants, pubs and pizzerias. The ancient historic building retains fascinating architectural elements that resemble the original structure. Among them, we find a majestic tufa arch at the entrance of the apartments. 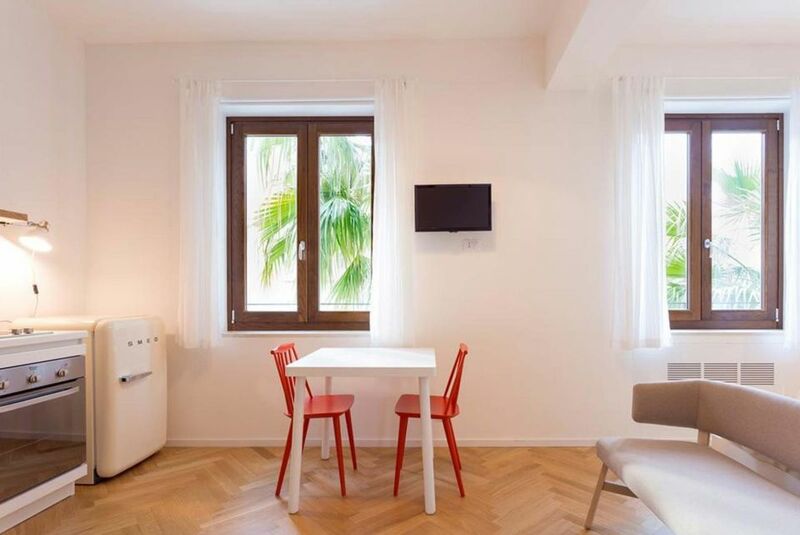 The Residence Palazzo Ossuna offers four types of apartments suitable for various types of travelers: from couple to family to groups of friends, for those looking for housing solutions falling under the category of "holiday homes". The apartments of the type "basic", two or three rooms, offer a Roman balcony with a wonderful view of the historic center of Trapani. The "comfort" apartments, without balconies, offer views of the courtyard of the Residence. The "comfort with balconies" are also equipped with views of the historic center. Finally, the suite at Residence Palazzo Ossuna is equipped with an exclusive private terrace. Among the various services offered by Residence Palazzo Ossuna we have free unlimited wi-fi, bicycle or scooter rental (fees apply), transfer service from and to Trapani Airport (for a fee) and car rental service payment).